How powerful a telescope is needed to see the things left behind at the Apollo Moon landing sites from here on earth? There are several parts to the answer. If you want to skip the details, here is the result. Human eyes can only detect objects that are about 1 arc minute (1/60 of a degree in size). To calculate the size of the details we need to see, we will solve the triangle defined by our eye, the distance to the Moon, and the distance we want to resolve. 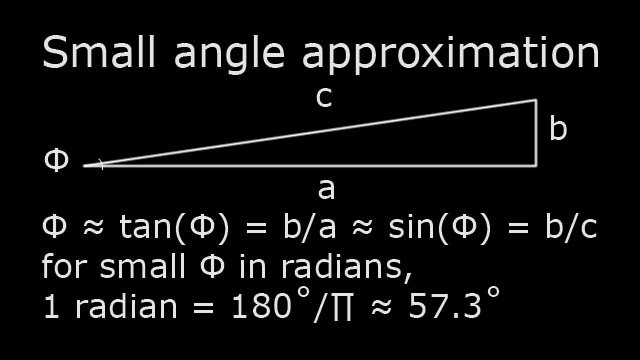 We will use units of Radians for our angles, because this makes the calculation simpler. Our telescope must have a magnification of at least 1.2 million times! We can calculate the focal length of our telescope using a magnification equation and our eyepiece focal length. About 4mm is the shortest eyepiece that we can practically use in a telescope. In addition to magnifying power, we need to consider the diffraction limited resolution of this telescope. The wave nature of light causes it to be diffracted when it passes through the aperture that defines the telescopes objective size. This puts a practical limit on the magnification of a telescope with a given size aperture before the image becomes too blurry. 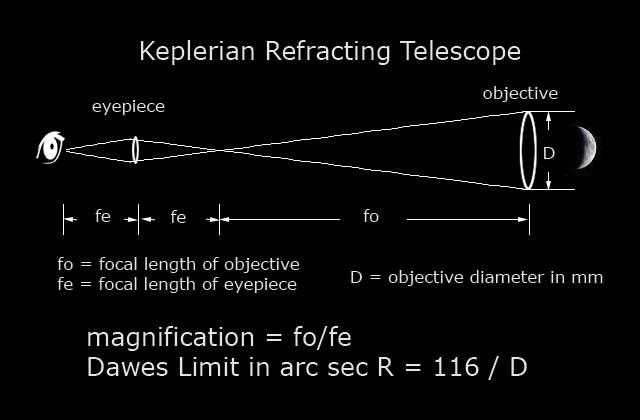 The diameter of the telescope's objective (lens or mirror) is determined by this diffraction limit. Turbulence in the air limits the detail that we can see to about 1 arc second. This will certainly spoil our view of the Apollo sites. The telescope needs to be above the air in low earth orbit to give us a clear view.